Custom Screen Doors Made in the USA! Screen Doors Designed to Exceed Your Expectations! 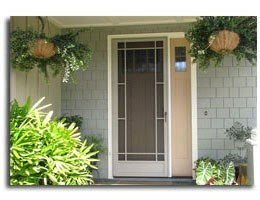 Many purchase wood screen doors for the natural feel or the nostalgic squeak of the hinges. They are a common choice for older homes or ones that have wood siding. What are the drawbacks of a wood screen door? Wood rots if not properly maintained (fig 3) which requires upkeep on a regular basis. They tend to twist resulting in gaps that can let the insects in (fig 2). Even with an unsightly tension cable in place (fig 1) they sag over time and are often out of square. The screen is stapled in and held in place with wood trim so it does not stay tight and is hard to repair. 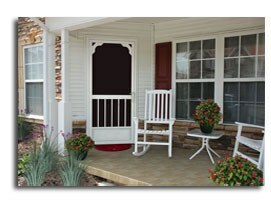 Vinyl screen doors are another option you may find at your local hardware store. They are more popular because they don’t require painting or staining. Some people believe they are more durable and require less maintenance than wood but looks can be deceiving. The vinyl screen door on the right is a perfect example; from a distance it looks pretty good. But upon closer inspection, the common issues come into focus. They may not rot but they do flex and warp (fig 2). Most are installed with inferior hinges which don’t hold the door in place causing sagging (fig 1) over time. Daily use will take a toll on any screen door and because vinyl flexes, the structural integrity of the frame can give way quickly (fig 3). Although the screen is easier to repair over a wood door, it uses a round spline which “rolls” out with minimal effort requiring yet another costly repair. Color options are limited since most vinyl screen doors are only available in white. Are you considering installing a Storm Door on your home instead of a screen door? Avoid the pitfalls and frustration of not choosing wisely for your home. Read 1st hand experience from a homeowner here. PCA manufactures a full line of attractive handcrafted aluminum screen doors right here in the USA that are built to last. Many manufacturers say their products will “hold up” or are “heavy duty” but only PCA has the design to prove it. 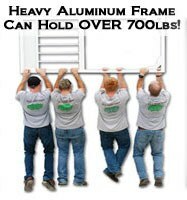 Our aluminum frame with incorporated corner keys can hold over 700lbs without bending, twisting or warping. The screen system utilizes a self-locking spline technology that has been tested to hold over 500lbs! PCA’s powder coated finish exceeds 4000 hours of salt spray testing (AMA 2604 compliant) which provides a truly maintenance-free finish even in the high salt coastal areas. Available in white, bronze, ivory, sandstone or clay; with a PCA screen door you have choices to match or complement the finish of your home. We've got the Screen Door For You.